Waiouru: The Bounder Startled Me! My usual Sunday walk didn’t happen due to another engagement, so I took to the hills this morning. Weekday in the conservation parks behind our house are nearly always quiet and today was no exception. I was quietly walking along deep in thought when this bounder jumped out at me from the bushes beside the track and jumped off into the distance. I was initially quite startled! Damned kangaroo’s: their colouring allows them to blend into the surrounding vegetation. 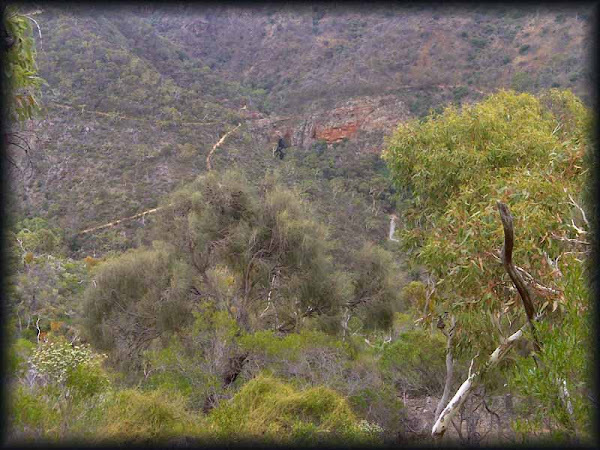 There is one portion of today’s track that opens out onto a rather scenic view of the gorge in Morialta Conservation Park. 2nd Falls are in the middle of the photo immediately to the left off the piece of brown/red cliff. There has been little rain in the past few weeks which means the falls are almost dry. My thoughts have turned to the sale of the smaller of our two cars. I’ve been very impressed with the Hyundai and would happily purchase another sometime in the future. Over the next couple of days two more removalists are calling to inspect our household effects and give us a quotation to move them to New South Wales. Time marches on and we have less than three months before we depart for England.